The Toronto office has been part of HOK’s Canadian practice since 1997. National corporate clients served by the Toronto office include CBC, Cisco Systems, EY, Macquarie Group, Marsh & McLennan Companies, OpenText, RSA, Rogers Communications, Royal Bank of Canada, TD Bank and Thales Group. HOK’s Toronto studio won an ARIDO Award of Merit and was featured in Azure Magazine and the The Architect’s Newspaper. Planning, design and compliance architect for Ontario’s first fully digital hospital: Humber River Hospital in Toronto. Donated time and resources to community projects including the lobby renovation for Variety Village, Camp Ooch (a camp for children with cancer) and the Transformative Camp for Single Mothers. Follow the Toronto studio on Instagram. Follow HOK’s Toronto studio on Instagram. The Toronto studio provides pro-bono design and raises funds for a YWCA shelter. HOK designed EY’s flexible new offices across 10 floors in Toronto’s newly constructed EY Tower. Sun Life’s new Toronto headquarters offers employees choices about how and where they work. “We’re seeing this ‘garagification’ to support more agile, creative, beta-innovation type spaces,” says HOK’s Caitlin Turner in The Possible’s article on the future workplace. HOK is designing a new regional transit centre and passenger processing facility at Toronto Pearson International Airport. Paul Gogan is HOK’s managing principal in Canada. Located on the penthouse floor of a downtown high-rise, EY’s new Client Experience Centre offers spectacular 360-degree views of Toronto and beyond. An oral history of HOK’s 20 years (1997-2017) in Canada as told by the people who helped make it happen. HOK’s Ryan Gedney and Jan Steinghas discuss why sports stadiums and arenas need mixed-use elements to thrive. Anthony Fieldman has joined HOK as senior vice president and design principal in Canada. NHL Commissioner Gary Bettman had high praise for Rogers Place, Edmonton’s new arena. HOK’s design for CBRE’s Canadian headquarters workplace in Toronto promotes communication, collaboration and employee wellness. Toronto’s new Humber River Hospital is one of North America’s most energy-efficient hospitals. TD’s newly renovated office in downtown Toronto earned WELL Gold Certification. HOK’s design of Cisco Canada’s new headquarters in downtown Toronto created a workplace that promotes radical changes in how its people work. HOK provided architectural and interior design services for a new office campus for Imperial Oil in Calgary. Volunteers from HOK’s Toronto office prepared and served a meal for 140 guests of the Ronald McDonald House. 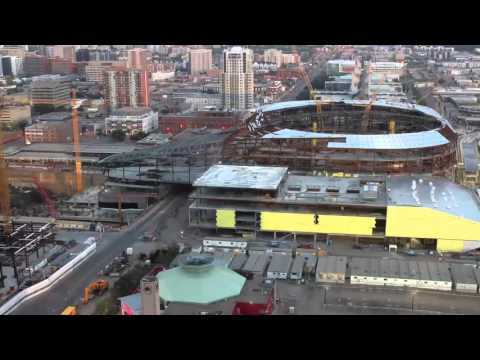 Watch a time-lapse video showing the second year of construction of Rogers Place, future home of the NHL’s Edmonton Oilers. The Architect’s Newspaper explores how designing new space for their own office enabled HOK’s team in Toronto to experience the virtues of the “new workspace” that it extols to clients firsthand. CoreNet named workplace projects for Cisco, OpenText and TD Bank as among the most innovative in Canada. HOK was the planning, design and compliance architect for the new, fully digital, 1.8-million-sq.-ft. Humber River Hospital in Toronto, which was delivered via a public-private partnership (P3). HOK’s new Toronto office, which won an ARIDO Award of Merit, is featured in Azure Magazine. HOK’s Toronto office was included in a roundup of the city’s best office spaces. A fly-through video of HOK’s plans for a streetscape revitalization in Halifax, Nova Scotia, demonstrates how urban planning can help the community and satisfy commercial goals. OpenText’s state-of-the-art executive offices in Toronto reflect the firm’s innovative culture. HOK hosted a P3 design workshop with West Park Healthcare Centre to shape the development of a new patient care center in Toronto. How can detention center architects help prevent helicopter jailbreaks like the one that happened﻿ in Quebec? HOK Director of Justice Jeff Goodale, ACA, described design strategies during seven radio interviews with CBC stations across Canada. Edmonton Clinic Health Academy, an HOK-designed healthcare education and research facility at the University of Alberta, earned two awards from BOMA Edmonton. Killbear Provincial Park Visitor Center fits within the rugged landscape and celebrates the natural environment. Google Canada’s newest office is a 58,000-sq.-ft. workplace stacked over five floors on Richmond Street in downtown Toronto. CIBC gives its people flexible, sustainable office environments that support how they work. Canadian pride and community connection shape Delta Hotels’ brand standards.